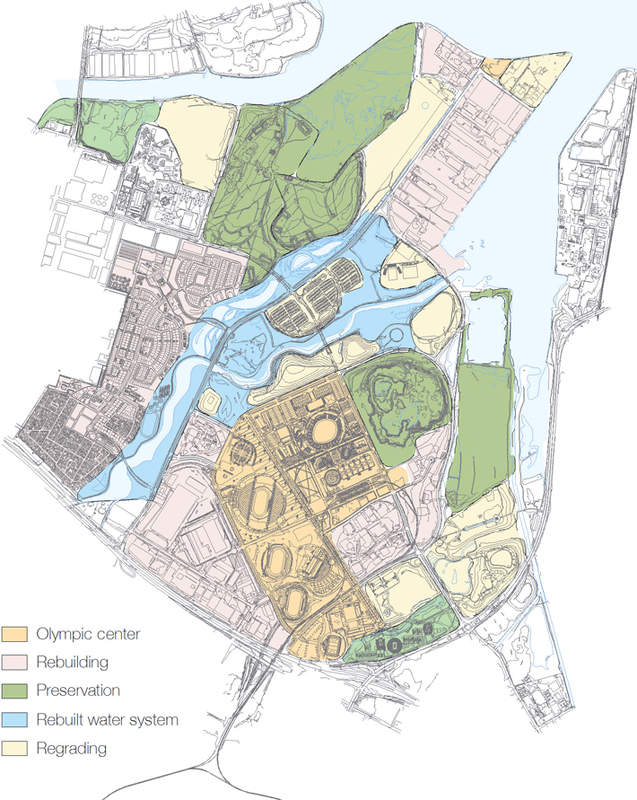 The 2000 Olympic Games were slated for a thousand-acre site in Sydney, Australia. Much of the land had previously been used as both a slaughterhouse in the nineteenth-century and for heavy-manufacturing facilities and naval munitions storage in the twentieth-century. 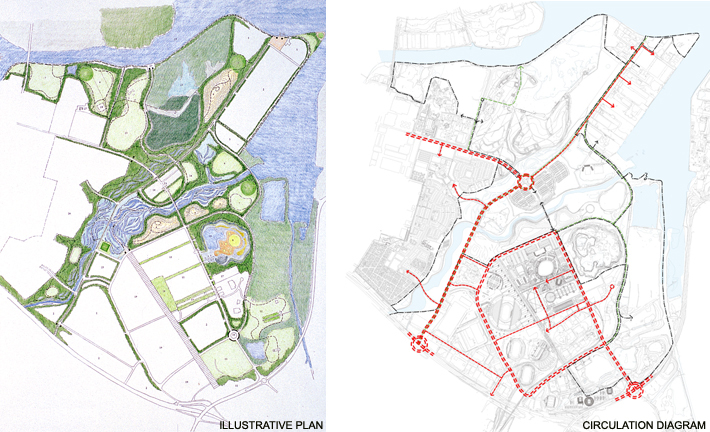 These activities resulted in a highly contaminated site with little natural ecology and a fragmented stream corridor. Sixty-five percent of the soils were required to be excavated and contained on-site. 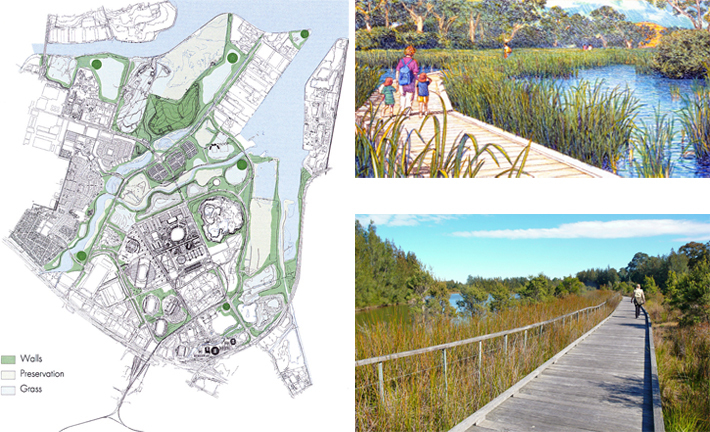 The site did have some positive attributes that PWP enhanced in the design: 15 miles of continuous waterfront; various historic buildings and landscapes; an almost unspoiled 124-acre aboriginal forest; major areas of mangrove swamp; bird sanctuaries; and surviving endangered species like Golden Orb spiders and the Green and Golden Bell frogs that resided in a 70-acre historic limestone quarry, the Brick Pit. 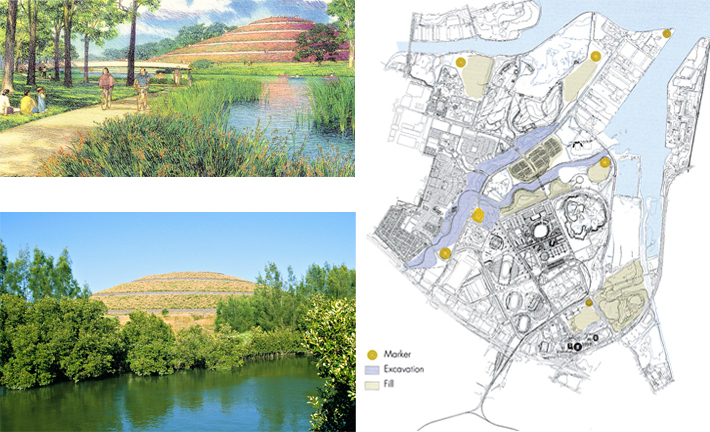 This complex site required an exacting touch in order to link the existing ecology with newly restored ecologies while allowing for exploration through the park and passive and active recreation. As you approach the park you travel along forest lined boulevards and upon arrival you are greeted by a lushly planted park village. Restoration and linkages of the native ecologies is also a main component to the project. This effort included restoring Haslam’s Creek, building pools to harvest and clean run-off for irrigation, creating a major riparian wetland, reforesting large tracts of re-contoured land, and reconnecting these ecologies with the preserved aboriginal forest and mangrove swamps. A large network of pedestrian and bicycle paths wind through the park and allow visitors to experience the native ecologies, the open rolling parkland topography, a waterfront boardwalk promenade, and the surreal lawn of the historic naval base and Brick Pit that have been preserved. PWP devised a layout and program for the park that continues to flourish as the hub of Sydney’s recreational activity a decade after the Olympics have come and gone.